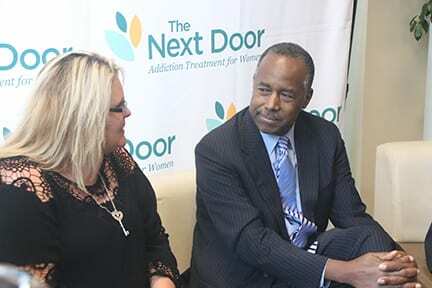 Melissa Newman-Brewer tells HUD Secretary Ben Carson about being admitted twice to The Next Door and getting the help she needed to recover from opioid addiction. NASHVILLE, TN – Last week Congress passed the $3.3 billion Support for Patients and Communities Act to address the national opioid crisis. The day after it passed, Housing and Urban Development Secretary Ben Carson visited The Next Door Recovery Center in Nashville. In 2017, 72,000 Americans died from drug overdoses, the highest number ever. The federal Centers for Disease Control say 47,500 of those deaths involved opioids. A parallel to the current crisis is the AIDS epidemic which killed 50,000 in the U.S in 1995, the highest number in any year. So opioids are killing more people than AIDs ever did and the killing is not nearly over. It hasn’t even slowed down. Carson toured the facility on 22nd Ave where 82 women are in recovery, many from addiction to pills. Melissa Newman-Brewer sat next to Carson on a couch and told him after staying clean for nine years she had a relapse and re-entered the program. “Are you clean now?” Carson asked her. “Eighteen months” she said. When women come to The Next Door they “roll in on two wheels” and the staff is like a MASH unit. Withdrawal takes three days and the detox unit can handle a dozen patients. After that recovery starts with seventy other women who get residential care and live in two-person dorm rooms. They get a variety of services and therapy. There are 21 units of affordable housing across the alley where women can reintegrate, find jobs, and rejoin their families. The treatment program delivers medical and mental health services and relies heavily on the 12-step recovery program. There is a chapel and it is used by individuals and groups. “The thing that is most import is the continuum of care. Even after they complete detoxification, you still need a support system,” Carson said. He said he wanted to come visit The Next Door because of its reputation as a place that recognizes that. “I’m always thrilled to see people who are willing to sacrifice themselves to make sure that life is better for other people,” he said. The 1,500 women who find help at The Next Door are lucky. The center has an $8 million budget. About $750,000 comes from federal programs and HUD gives about $100,000 annually. Four and a half million comes from Medicaid, Medicare, TennCare and other medical insurance. The remaining $2.5 million of the operating budget comes from private donations. Scientists at the Centers for Disease Control say the necessary amount to really treat opioid addiction is $78.5 billion a year. A measly $3.3 billion will not stem the tsunami of opioid overdose deaths. At that level of cure, some estimates predict that hundreds of thousands more will die in the next decade. Addiction experts say just throwing money at the problem won’t fix it either. According to Sarah Wakeman, an addiction specialist at Massachusetts General Hospital, most addiction treatment programs don’t treat addicts like a patient with a chronic disease, yet that is what they have. She said the country must mount a campaign on a par with our response to HIV/AIDS. 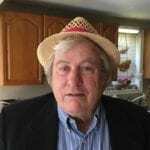 “It will require a massive infusion of funding and a fundamental restructuring of how we treat addiction in this country,” Wakeman said.